PRODUCT Mineral crystal deodorant stick HK$20-30. They are sold under various brands such as Crystal or Naturally Fresh. PRODUCT RATING Very good (when used correctly – see below). It doesn’t prevent you from sweating, by clogging up your pores, like antiperspirants and it doesn’t cover up the smell with a strong fragrance, like conventional deodorants. It lets you sweat naturally, but inhibits the growth of bacteria that causes body odour. GREEN RATING Quite Green. The crystals occur naturally and do not contain synthetic chemicals like conventional products. The packaging is excessive, however the product is much smaller in size and last significantly longer (up to 9 months) than conventional products thereby producing less garbage overall. Sweat is important in allowing the body to naturally cool itself, but many of us are concerned about smelling bad. Antiperspirants use an aluminum based compound to prevent sweating. Aluminum ions are drawn through ducts in your skin into your cells. The ions bring water with them, causing the cells to swell and squeeze the ducts closed so sweat can’t get out. For those that sweat alot, this may permanently shrink the sweat gland, decreasing the amount of sweat it can produce. To read more about how they work click here. In contrast, deodrants use strong fragrances to cover up smell and contain hazardous anti-bacterials like Triclosan to inhibit the growth of the bacteria that causes odour. Conventional deodorants and antiperspirants contain a myriad of chemicals that may or may not be good for your health. Overall, we highly recommend this product. However, like all things green it involves a different set of compromises, such as less convenience but greater health and environmental safety. can i buy this Crystal brand in HK ? 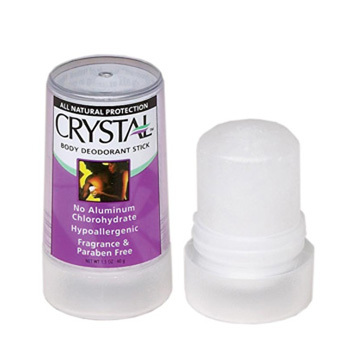 I want to buy this brand’s Crystal Body Deodorant 3 oz Rock. You can find them in Sasa.